I have finished my April Bead Journal piece. Yes, I’m clearly a bit behind, but plugging along! I did not encrust the whole piece this time – partly to save time and partly because I chose a more planned, geometric design, and I think it looks nicer with a bit of white space. However, my beads (mostly size 11) were a little large to get the detail to fit into the relatively small piece of felt. So, I just beaded what I could of the design and improvised the rest. I had some lovely Mookite stone beads in various shades of dark red as well as tan, so I worked those in, too. Overall, I think the piece came out nicely and definitely reflects the sunny bright feeling I had in April with the onset of spring as well as the Easter season. Previous March Bead Journal Project – finished! You did a VERY nice job and I actually think your choosing to leave the white was a good idea! Allows your beading to stand out more against the background. This turned out lovely! 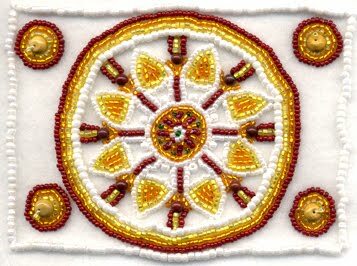 It reminds me of a mandala or perhaps a medicine wheel and I do like how the beaded design stands out against the white. Very nicely done! This is happy, Carol! I love the colours and design. Now all you need to do is add some 15's to your stash and then you will be as crazy as me. LOL! I love all encrusted pieces, but for the same reasons you mentioned, I have never done one that's encrusted. This piece wouldn't have the same dimension if encrusted. Leaving the background to show through was the perfect choice! The white space lets the beadwork breathe and gives it space to be appreciated. I'm glad you went with your instincts as this is a delightful piece. I love to dye Ukranian eggs and this definitely has the feel of Pysanky! Good job!It's so different than your other pieces… I'm wondering if it might represent some change, maybe a path toward more order, in your life? I'm always looking for what's under the choices made in these journal pieces, but I realize sometimes it's just what it is.Robin A. Thanks, Robin – and yes, perhaps a desire for more order! With two kids under 4 at home, order is something I don't have much of at the moment! :)And how fun that you are familiar with and have done Pysanky!